Abby Noelle Harders is the 15 year old daughter of Scott and Sandy Harders, and hails from Moundridge, Kansas. She attends Haven PA Virtual School, and will be a sophomore this fall. Abby enjoys barrel racing, break away roping, goat tying and trail riding on her horse Sadie. Some of Abby's favorite past times are playing piano, violin, creating rodeo queen clothes, mudding, shed hunting and singing the National Anthem at local rodeos. Abby wants to thank her beloved family and friends for everything that they have done for her and knows that without their help and God in her life, she would not be where she is at today. During the 2014 Miss Teen Rodeo Kansas Pageant Abby also took home honors in Horsemanship, Speech, Rodeo Knowledge, Photogenic. 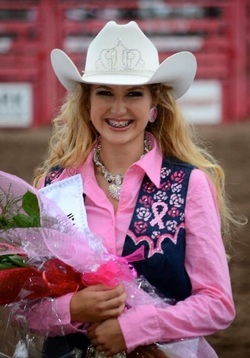 Abby has held several titles including Miss CPRA Princess and Miss Been Empire Days Princess.